At East Coast Podiatry Clinic, we feel that you should be rewarded for helping us help your family and friends. In order to achieve this, we offer you a $10 new client referral program. HOW DOES THE REFERRAL REWARD PROGRAM WORK? 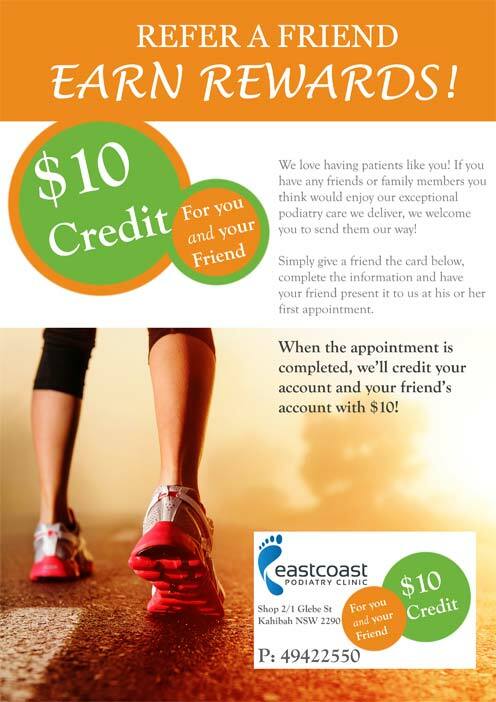 For each patient that you refer to East Coast Podiatry Clinic, we would like to say thank you by rewarding you $10 towards your next podiatry appointment with us. The $10 reward can be used towards any podiatry treatment undergone at East Coast Podiatry Clinic, but cannot be redeemed for cash. A “Referral” is an individual who is not currently an existing patient. Your referral must be seen in our clinic for a podiatry treatment. We look forward to seeing many more of your family and friends and sending our rewards to you.